Since this is the third book in a series, I don’t want to give a synopsis and spoil previous books. 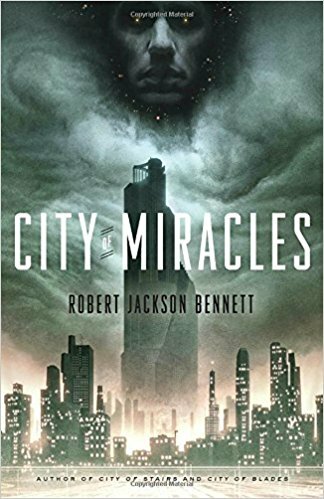 A few quick details: This installment takes place nearly twenty years after the first book and follows Sigrud (a side character from both previous books) as he avenges a murder and then gets involved in a plot involving the children of divinities. Again, to avoid spoilers, I’ll keep this review short. This was a very satisfying end to the series. This book had more in common with the first, but its own unique elements as well. I liked seeing the progress of characters, cities, and culture over time. This one is bloodier and more gory, but I would’ve guessed that given that Sigrud was the primary narrator, and it was never so gory that I got turned off. I particularly enjoyed some of the more philosophic conversations that sprung up in dealing with divine creatures again. There were a lot of parent-child relationship issues that reminded me of some of the classics I’ve read (like Fathers and Sons), where the adolescent child believes they have all the answers while unknowingly repeating all their parents’ past actions (both good and bad). (How many of us with teens have seen that firsthand?) And then the series offers a nice, ambiguous note, simultaneously hopeful and ominous: People will be people, regardless of whether or not divine powers are involved. Yes. I approve. Also, the audiobook version continued to be great. This entry was posted in 2017, Adult, Prose and tagged audio, divinity, mini-review, POC, speculative. Bookmark the permalink. I totally agree with your review. There was a lot of philosophy and parent-child dynamics, which I really, really liked (and I don’t normally say that about philosophical discussions). Plus, I LOVE the fact that Sigrud got his chance in the spotlight. Talk about a tortured character! I would definitely read more of what Jackson has to offer. I think for me it would depend on what kind of books he’s written. I could see them being too much for me, you know? But I’d tentatively try them!